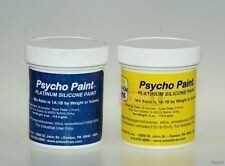 Psycho Paint is a versatile and easy to use platinum silicone paint base developed to help special effects and prosthetic artisans, doll makers, etc. easily create painted-on color effects for their platinum silicone creations. It is a two component translucent clear platinum-cure silicone that is used to make a base for color pigmenting. 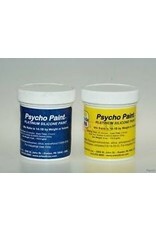 Once the desired color is attained, Psycho Paint is thinned with a solvent. Thin layers of paint can be then be applied to a model's surface (made of Dragon Skin, Ecoflex or other platinum silicone) using an airbrush. In addition to painting the exterior of a cast piece, you can apply Psycho Paint to the inside of a platinum silicone or urethane rubber mold and then cast platinum silicone behind it. It can also be applied by brushing.